Rich in design and elegant in their choice of colourways, the Elgin rug collection by Asiatic Carpets brings comfort, warmth and true modern style to your home. 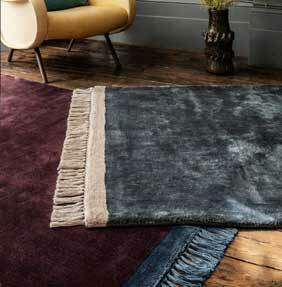 Each rug has a truly luxurious feel as its main body is matched with contrasting tassels. Each rug features a thick and comfortable pile and the choice of colourways ensures you can find a stylish Elgin rug for your home. Each Elgin rug is woven by hand with great care and features a pile of 80% viscose and 20% cotton. The rugs have a gentle sheen and are super soft to touch and under foot. There are a choice of three rectangular sizes available in the Elgin rug range ensuring their unique and stylish design can be enjoyed in many different homes.